A marriage that lost its spark. And a woman determined to light a fire under a cavedweller. Share the adventure of one couple’s efforts at reigniting their relationship in this G-rated journey through fifty dates. 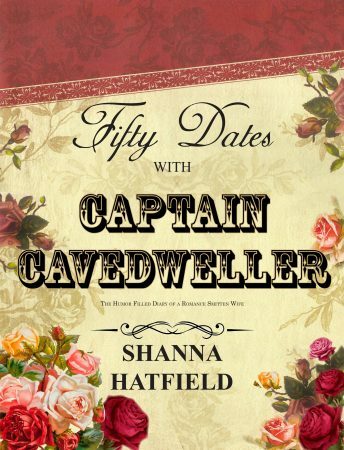 Waking up one day to discover they’d gone from perpetual honeymooners to a boring, predictable couple, USA Today Bestselling author Shanna Hatfield and her beloved husband, Captain Cavedweller, set out on a yearlong adventure to add a little zing to their marriage. This journal provides an insightful, humorous look at the effort they made to infuse their marriage with laughter, love, and gratitude while reconnecting on a new, heartfelt level. There are a few things that Captain Cavedweller gets really, really excited about. One of them is football. From magazines talking about football to watching games on television to attending local high school games, he can’t get enough. He’s even been known to sit and watch reruns of football games if he happens to find one airing in the summer months. Because of his football obsession, for his birthday I purchased season tickets to the arena football games that take place an hour away. Today’s big date, hosted by CC, was to drive to the city to pick up the tickets, visit a couple of car dealerships since we are hunting for a new vehicle, and then take me out to eat. Picking up the tickets was fun. The team members were so gracious and friendly and let those attending know they truly appreciate the support of the game. Car shopping also went pretty well considering we never saw a single car salesman. Generally, we can barely get out of the car before one swoops in, trying to talk us into vehicles you would never see me ride in dead or alive. Apparently, the forty-mile-an-hour winds coupled with frigid temperatures kept them inside the showroom where it was warm and toasty, and their hair wouldn’t turn into a wild snarled mess, resembling something created by Medusa’s own hairdresser. Once I started crying and begging for mercy from the wind (okay, I wasn’t crying, but the wind did make my eyes water. A lot. ), CC offered to take me to the mall. I was not in a shopping mood at this point, much more interested in sitting down somewhere warm.